Malwarebytes is one of the most popular and effective anti-malware programs that offers protection for Windows and Mac computers and removes recent spyware and malware. Developers continue updating their security software. 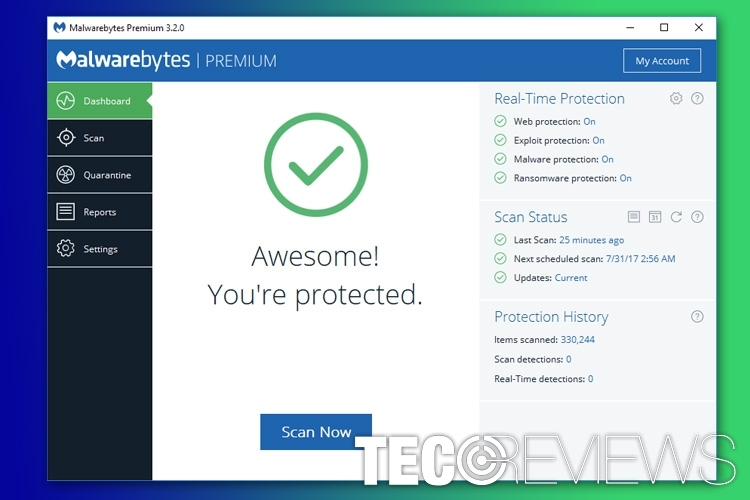 Finally, they presented Malwarebytes 3.2 – the beta version of the program that promises better usage and enhanced stability. Since the release of Malwarebytes 3.0, this anti-malware has been widely discussed by security experts and users. The program received lots of critiques and negative feedback. However, it seems that developers learned from their mistake and fixed the major flaws. The beta version marks the era of new company’s products. This security tool is supposed to replace regular antivirus programs. It is developed from the ground up and includes the best features of other products, such as Anti-Malware, Anti-Exploit, Anti-Ransomware, Website Protection, and Remediation. The program is available for testing. Therefore, in this article, we are going to share our insights and latest Malwarebytes review. support service available in several languages. The main process of the anti-malware software MBAMSrvice.exe drops below the 200,000 K mark on 64-bit versions of Windows. Nevertheless, it’s a significant change; the program remains large and heavy. It still runs three different operations on Windows operating system. The 3.0 version of the security software had several stability issues. The program used to crash and hang because of the service, tray application, and user interface. Developers claim that these problems were solved; so, there should not be any crashes with 3.2 version. 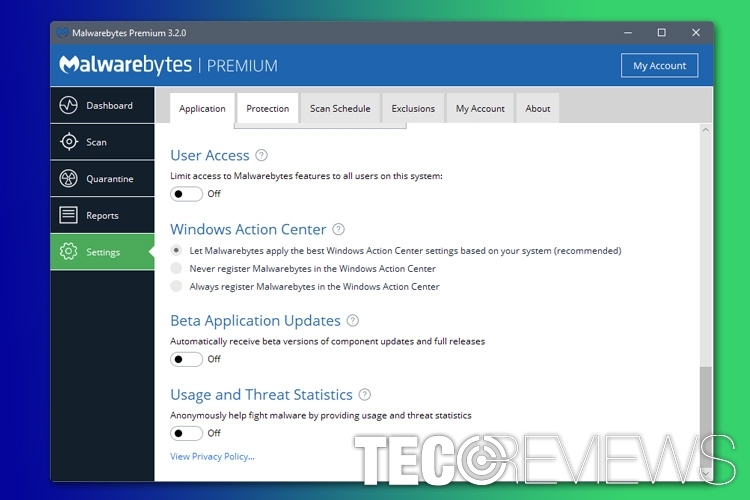 Malwarebytes users, who wanted to update software to beta versions, had to do it manually. With a new version of security software, users no longer have to do it. The company included a new feature that allows automatic beta versions installation. Click on the Install application updates button. As soon the download is over, users can try new features and components of the program. However, we want to remind that beta versions of antivirus or security software might have bugs and use it is not always a good idea. Inside the program, users can find a new button under “My Account” tab, but there might be few stability issues with it. However, with the help of this button, users now can get access to “Malwarebytes My Account Portal” where they can manage their subscription. Indeed, the updated security software is not for free. In order to protect the device, people have to pay for its subscription. In order to do that, users have to create their Malwarebytes account profile settings. The creation process will take only a few minutes. 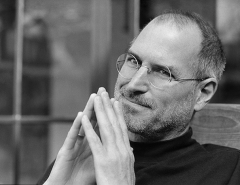 The beta version might attract the most curious and innovative users. However, bugs and security flaws might emerge soon. Hopefully, they will be fixed as well before the release of a full product. However, the product is free to download. Meanwhile, the imperfect 3.0 version of the anti-malware software offers 14-day free trial. Once it’s over, users will have to upgrade it if they want to continue using full real-time protection service. However, users can continue using the program with a limited amount of features. Malwarebytes 3 free version only offers anti-malware/anti-spyware protection, removes rootkits and repairs their damaged. Thus, it won’t protect the computer in real time which is necessary and important for keeping your device and data protected. For that, users have to obtain a Premium version for 39.99 USD. Developers of the anti-malware software are ambitious. With the release of the 3.0 version, they started the journey of offering a better service than regular antivirus programs do by including the best practices and feature of their former products. The beta version of anti-malware fixes the flaws and helps developers to get closer to their goal. According to the Malwarebytes, 50% of their customers do not use additional antivirus and rely only on this anti-malware. The combination of their products allowed to create a powerful and multifunctional security tool that can protect from major cyber threats. However, we have to wait until Malwarebytes 3.2 from beta version turns to the full product to see how much they learn from the mistakes and enhanced protection from malware. Malwarebytes 3.2 Beta fixed flaws of the 3.0 version. The program is available for testing for free. Therefore, it might include bugs and vulnerabilities that might emerge soon. Developers continue creating the advanced computer protection software. ^ Announcing the Malwarebytes 3.2 Beta. Malwarebytes forums. The official website. ^ Khushaar Tanveer. Malwarebytes Premium 3.0 is now available for Windows computers. Windows Report. Windows 10 and Microsoft News, How-to Tips. ^ Martin Brinkmann. Malwarebytes 3.0: new all-in-one protection. Ghacks. Technology News. ^ Marcin Kleczynski. Announcing Malwarebytes 3.0, a next-generation antivirus replacement. Malwarebutes Labs. The security blog.